Many of us deal with hard water, damaging our appliances and making it difficult to do household cleaning. Luckily, water softeners can help by reducing the mineral content of our water supply. But what if you’re on a well? Well water tends to have higher concentrations of iron and other minerals, plus sediment – and it may require a special filter. In this guide, we’ll help you find the best water softener for well water. The recommendations listed below are made based on a combination of manufacturer specs, our own research and testing, and third-party well water softener reviews. The ABC Waters Triple Combo is a combination of products designed to offer a turn-key water filtration and water softening solutions for those on a well system. The first stage is an advanced water softener, controlled by the popular Fleck 5600SXT digital valve meter. This is a 48,000 grain, high-capacity and high-flow softening system, with upgraded resin for a longer lifespan. Next is the upflow carbon tank. This eliminates the need to backwash, which means you don’t need an electrical hookup, and there is no wastewater produced. This provides efficient filtration without many of the downsides of traditional water softener systems. 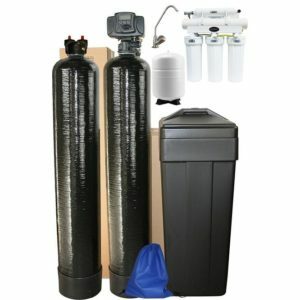 Last, you have a 5-stage reverse osmosis water filter. This is designed for drinking water, and only installs in your kitchen. Reverse osmosis technology is effective in removing a huge range of contaminants, from chlorine to sediment. Overall, this is among the best water softeners for well water. Click here to learn more. The Fleck Iron Pro 2 is the best water softener for well water for those on a budget. It’s an advanced water softener that’s effective in reducing mineral content in your water. Plus, it has a built in iron filter, designed to remove iron, manganese, rust, and sediment. For well water, this added filtration technology is essential, as traditional water softeners won’t necessarily remove iron and other heavy metals effectively. This is a heavy-duty setup, with a 64,000 grain capacity and a high flow rate. It can easily handle the water needs of a 4-6 person family, supplying water to the whole house. It can remove hardness up to 75gpg, which means it’s suitable for even the hardest water sources. The valve is the popular Fleck 5600SXT digital control valve, which features an LCD display with intuitive touch pad controls. It’s also built to last – the tank is warrantied for 10 years, and the digital valve is backed by a 5-year warranty. The Aquasana Rhino Well Water is an advanced filtration and softening system built into one product. It’s designed specifically for well water, and is effective in reducing mineral content and removing contaminants, chlorine, and sediment. It’s a whole-house setup, designed to filter up to 500,000 gallons and last roughly 5 years. It’s also unique in that it does not require electricity or back flushing, so it’s more environmentally friendly than some options as commonly pointed out in many Aquasana reviews. This is a pricey unit – but it’s worthwhile if you are concerned about your water quality. The salt-free softener does a good job at reducing mineral content. The innovative mix of activated carbon, copper-zinc & mineral filters do a great job of removing chlorine, heavy metals and other common contaminants. The UV light filter further purifies your water by killing 99.99% of viruses and bacteria (including E. coli and giardia). You can save 50% with code AQWFD50 when you purchase direct from Aquasana. You can also buy this setup on Amazon. Hard water is a common issue for those on well systems. If left unaddressed, hard water can cause all sorts of problems. It can degrade and damage appliances, dry out skin and hair, and leave unsightly mineral buildup in your shower and on your faucets. Using a good water softener for well water with iron and other contaminants can help to reduce the mineral content of your water. This is useful for a variety of reasons. For one, it prevents mineral buildup in pipes, appliances and near faucets. It also helps soften your water, which can help keep your skin and hair softer and your laundry fresher and softer. Water softeners in general offer a lot of benefits. However, some of them simply aren’t designed to handle well water. 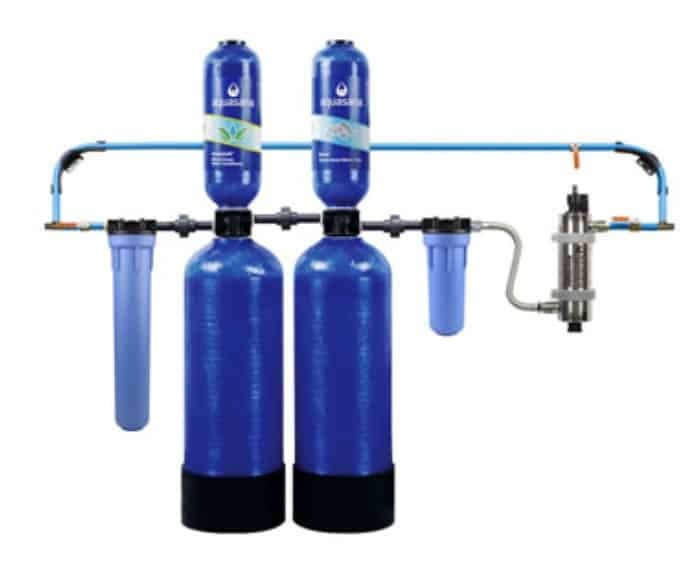 The best water softener for well water will be specifically designed to handle the higher iron and mineral content of water sourced from wells. How hard is well water usually? How does your water stack up to your neighbors, or to those on city tap systems? The answer to these questions can vary quite a bit, depending on your location, how your well is built, and your water source. The Water Quality Association maintains a water hardness scale while the US Geological Survey has data on water hardness around the country. To find out how hard your water is, we recommend completing a well water water test at home, and comparing your results to the hardness scale referenced above. 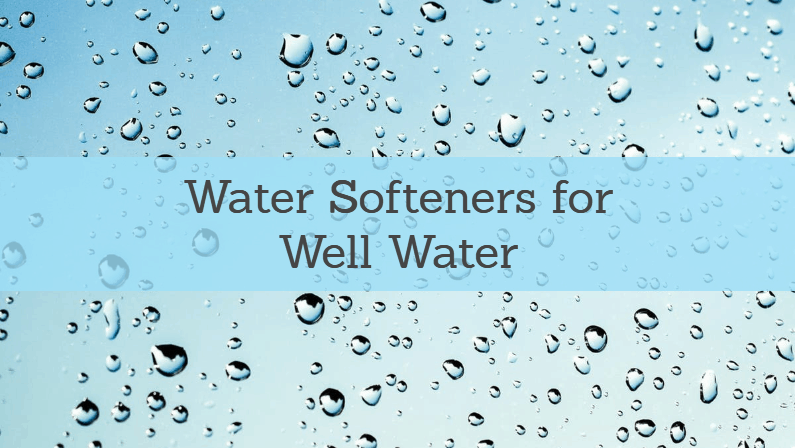 Softening & Filtering: Most people on well systems will want some sort of water softener – and they’ll also probably want a water filter for their drinking water. We chose several systems that combine both, allowing for effective water filtration and softening in one. Water Flow/Capacity: We chose whole-house systems that are built to handle a large volume of water, and maintain good water pressure. All our recommendations can handle the water needs of a family household. Reviews: We focused our efforts on testing and research – but we also looked at well water softener reviews from customers. This was the best way to evaluate how well each unit worked with a variety of water sources. Durability: These systems can get pricey, so we wanted to choose units that were built to last for a long time. We looked at build quality, materials used, data from reviews, as well as warranty info to make a call on how durable a system may be. ©2018 WATERFILTERDATA.ORG. ALL RIGHTS RESERVED.